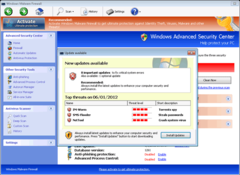 Windows Malware Firewall is similar to other rogue antispyware programs like Windows Guard Tools. (PRLEAP.COM) In a released removal report specific to Windows Malware Firewall, PC users have been educated on the dangers and repercussions of utilizing a rogue antispyware program such as Windows Malware Firewall. Within the report, security researchers from EngimaSoftware.com outline how a program such as Windows Malware Firewall is able to utilize money extortion techniques with success. Moreover, the same report gives those effected PC users an outlet to removing the Windows Malware Firewall program, thus saving their system from future issues. A significant development has occurred in analyzing programs such as Windows Malware Firewall. Many of these rogue antispyware programs related to Windows Malware Firewall, such as Windows Turnkey Console, Windows Pro Safety or Windows Guard Tools, were created by the same family of relentless hackers. These hackers are all in the business of marketing fake security programs. Computer users may better understand Windows Malware Firewall and how it can be removed by a newly released video titled "How to Detect and Remove Windows Malware Firewall" linked below. Security experts will reiterate why it is necessary to remove Windows Malware Firewall from a PC. Moreover, they will explain that it is essential that PC users avoid purchasing Windows Malware Firewall unless money is no object. In any case, take the necessary precautions when confronted by the fake security program Windows Malware Firewall.